I’m doing a series of gear posts as my start date gets closer and closer. Here’s everything shelter-related that I’m bringing. I was previously using a Nemo Hornet 2P. I liked this tent but it was unnecessarily large for me. Trekking pole tents were appealing because I wouldn’t have to carry around the dead weight of tent poles all day, reducing weight and volume. 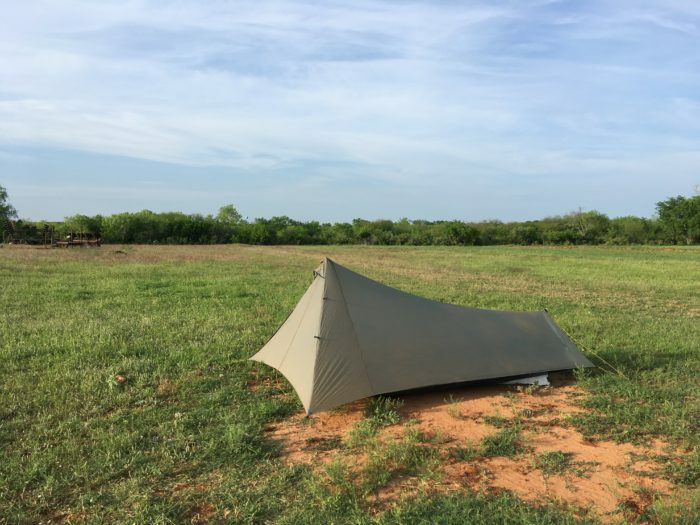 I had a hard time choosing between the Tarptent Notch and the ProTrail but eventually settled on the ProTrail for the surprisingly low price of $225. 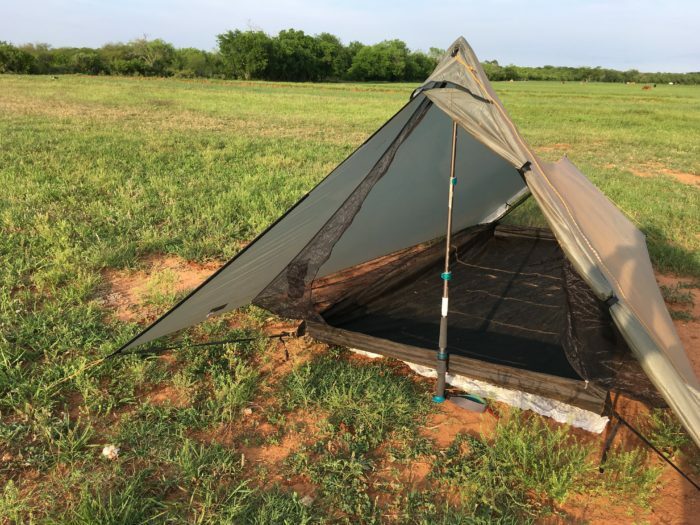 Don’t let the name fool you; the Tarptent ProTrail isn’t actually a tarp shelter. I’m not that much of a barbarian (yet). It’s a fully enclosed silnylon shelter with an attached bathtub floor, and mesh front entrance and back/side ventilation. It’s considered a one-person-plus tent so it can technically fit two people who really like each other or one person and their gear. I like that I’ll have a little extra floor space to store my pack and sort things out. I’m still getting comfortable with setting it up and I’m a bit nervous about using a single-wall, non-freestanding tent. If I decide that I hate it, I think I’ll switch back to the Nemo Hornet but go with the one person this time. I’ll definitely let y’all know how it goes. Hack: use the remainder of a tube of seam sealer to draw horizontal lines on the floor of your tent to keep your sleeping pad from slipping around. Tried and true. Doubles as a “hiker to town/hiker to trail” sign. Hack: run your shiny new Tyvek through the wash twice (no soap) or else it will be ridiculously loud. Make sure you do this before trimming it to the shape of your tent’s footprint as the wrinkles that occur will cause it to shrink significantly. This umbrella from Gossamer Gear is the only chrome umbrella I could find that’s collapsible — it folds down to shorter than a one-liter Smartwater bottle. It fits perfectly alongside my water bottle in my pack’s side pocket and will provide some relief from the sun. This will be my first time using a hiking umbrella but if I find that it helps that I don’t mind carrying it even after I leave the desert. I’m on my second pair of these poles. The first ones got gnawed up by mice, then left in the bed of a truck on a hitch back to the trail. I like them because they’re sturdy and easy to adjust depending on the terrain. I can take them apart completely and fit the six pieces in my backpack as carry-on luggage and put them back together with no problem. These will also double as my tent poles for this adventure. 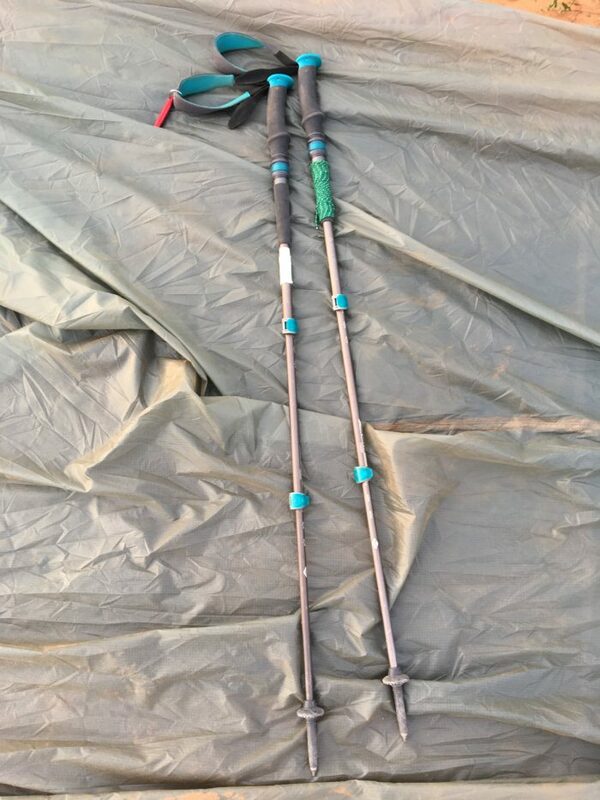 Hack: wrap a bit of extra string and duct tape around your poles. I got this to keep everything else in my pack dry for when I have to pack up a wet tent in the morning. The stakes that came with the ProTrail quickly broke so I ordered these, which come in a pack of 10. I’m going to carry the four required stakes for the setup of my tent plus another four for windy conditions and for the inevitability of losing or breaking one.